Hello there old beans! Whist the ole blog has been chilling for the last month this sassy lady has been out enjoying the bizarrely summery March/April weather we’ve been having. There have been BBQs, dog walks, reading books in the sun and working hard on my post surgery rehab. Winning at life! And now has the weather has finally turned (5 degrees this morning – eep!) it is totes the right time to share with you my sassy new make. It’s a little bit autumnal, a little bit fun and a whole lot of snug – just the way I like my outerwear. 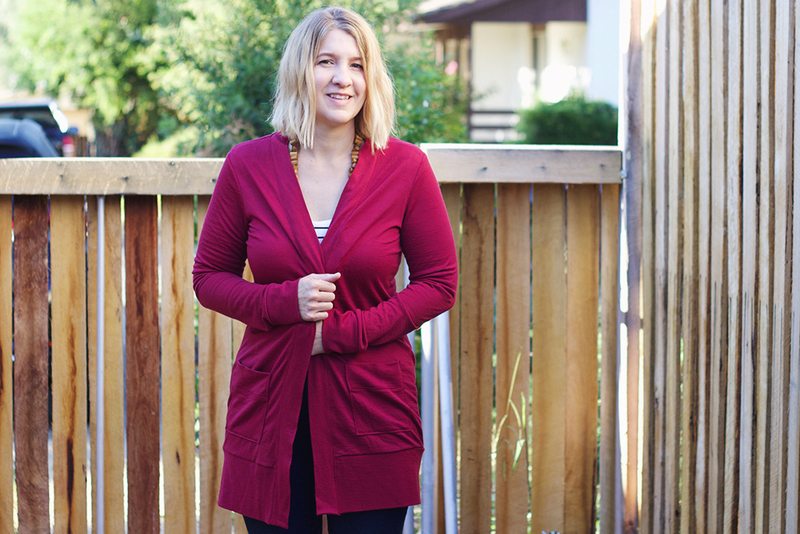 This comfy number is the Blackwood Cardigan from Helen’s Closet. 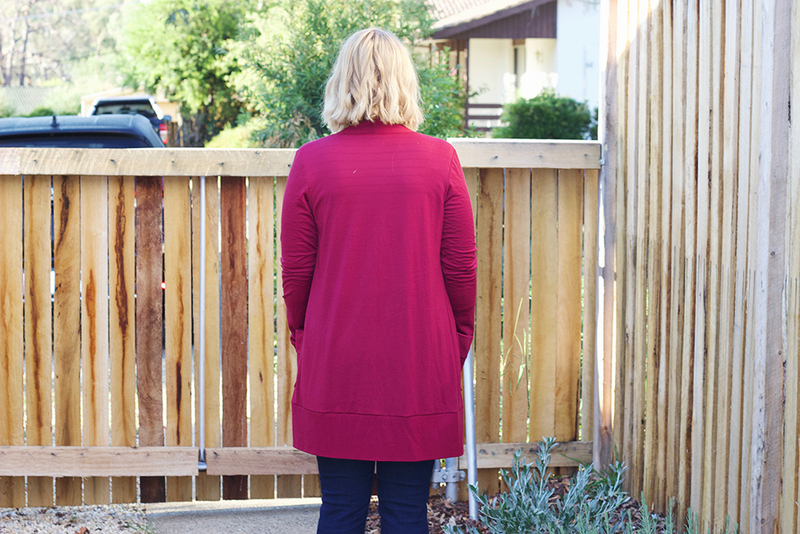 The Blackwood is an open front cardi with a fitted shape and delightfully long sleeves. There are two variations: View A hits mid-thigh with hand-level patch pockets and View B ends at the hips and lives its life pocket free. I decided to step outside of my regular style zone and made up the View A – also, I can’t say no to pockets! One thing to note with this pattern is it available in PDF only but it does come with everyone’s favourite Copy Shop option. You better believe this lazy efficient sewist was at Officeworks getting that A0 print within 30 minutes of ordering the pattern! The fabric for this make is a lovely merino from The Fabric Store in the colour way Marsala. The colour is crazy rich, has stayed vibrant after three washes and, most importantly, did not run at all in the pre-wash. There may have been a recent pre-washing fail that resulted in pink sheets so colour fastness is currently a high priority in this house… As I wanted a cardi with some warmth to it I went with the 195gsm merino which has a little substance to it but isn’t super thick. This is a great transitional garment weight and keeps you snug without risk of turning into an overheated sweaty mess! The design lines. This is not a big and boxy cardigan pattern and I love it. As the design is close fitting it layers well under jackets and doesn’t make me feel frumpy wearing it. Yay! The overlocker construction. I’m plugging away at fitting a new Bellatrix Blazer which is taking some time and being able to pull something together on the overlocker makes me happy. This finish is strong and also looks super professional! The sleeve length. This is a great length to pull over your hands if they get a little cold. Boom! No worries if I forget my gloves! Add some thumb holes to the sleeve band. Helen has a great tutorial for this and you better believe my next version will have this. Do a full bicep adjustment. Whilst my buff guns fit into this a little extra wiggle room would be fabulous! 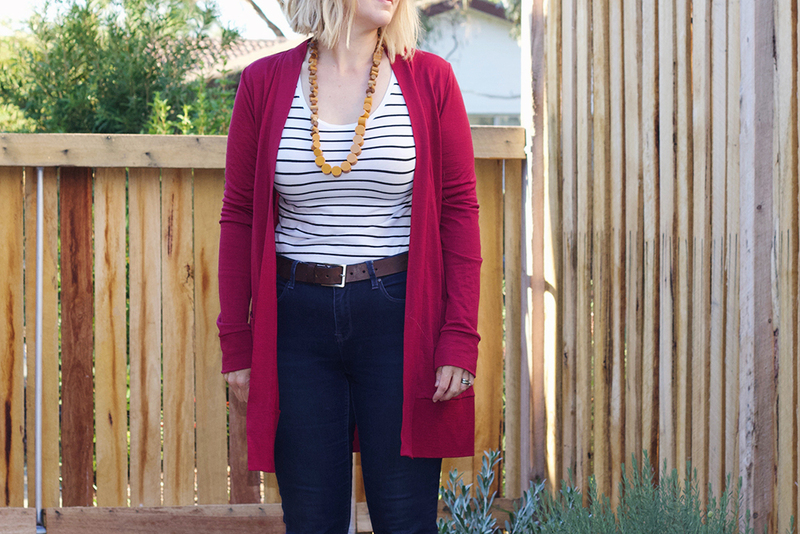 Overall, I really love this cardigan and have been wearing it heaps. It looks super autumnal paired with my paprika Peplum Top and going into camouflage mode around all the turning leaves. Bwah ha ha! I am super keen to make another one but first I have to put the finishing touches on my current project. Yes, it involves swimsuit fabric. No, it may not be seasonally appropriate. But why let warmth stand in the way of a crazy great idea?! Snuggly and fab indeed. Can’t see that band design choice either! I LOVE Paper Girls! I started reading it on a whim and couldn’t stop! And I definitely can’t tell the difference in the band, so I think you’re golden. It looks great. That colour is perfection. I don’t at all see what’s wrong with pink sheets? 😛 Love this though – great proportions on you and I love the fit through the shoulders (as a fellow shoulder-endowed it automatically makes me want to try it knowing it looks so good!) and that colour is perfect for when it gets a bit chilly – so warm and yum!